A mystic Black Wind (Kuroikaze in Japanese) destroys or wilts everything with which it comes in contact. Some people refer to it as the Divine Wind (Kamikaze) similar to the two typhoons that sank Mongol fleets invading Japan in the late 13th century. In this alternative history of World War II, the Black Wind rather than the military's Kamikaze represents Japan's only hope to stop the Allied advance toward the Japanese mainland. This well-researched historical novel is a first-rate thriller with touches of horror. 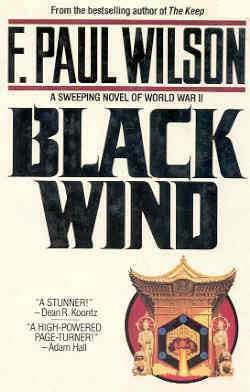 F. Paul Wilson, author of over 20 novels, considers Black Wind to be his best book. This epic covers Japanese and American relations from 1926 to 1945 through the lives of Matsuo and Hiroki Okumo, two Japanese brothers; Frank Slater, Matsuo's American friend in childhood; and Meiko Mazaki, first engaged to Hiroki, then married to Frank, and next to Matsuo. Although Wilson has achieved renown for his thrillers and horror stories, the author naturally places the book's main characters in the middle of significant historical events such as the Pearl Harbor attack and the atomic bomb's testing and deployment. Hiroki's position as Minister of Military and Economic Coordination, Matsuo's service in Japanese Naval Intelligence, and Frank's role in U.S. Naval Intelligence provide these characters access to top military leaders and their secret plans. The monks of Kakureta Kao (Order of the Hidden Face) infuse mystery and evil into this exciting novel. These monks once held and find again the secret of the Black Wind, and through Hiroki Okumo they use their power to influence Japanese politics and military strategy. They unleash the Black Wind on several small Pacific islands and intend to use it as a supreme weapon against the Allied forces planning to invade Japan. The Kakureta Kao's monks, with many of their body parts surgically mutilated, represent pure evil as they plot annihilation of the enemy. Matsuo Okumo sacrifices himself in the end in order to destroy forever the Kakureta Kao cult. Some Japanese consider that their military leaders sacrificed the country's youth during World War II when they ordered them to carry out mass kamikaze attacks. This novel takes sacrifice much further as the military calls for the wholesale deployment of the Black Winds, which require surgically-altered young children to generate a "strange, alien, supernatural" wind that kills all animal and plant life in its surrounding area. One Hidden Face monk, who has guided Hiroki from childhood to his ascension to political power, even talks of sending a mother and small child in an open boat into a group of American ships such as those at Manila Bay. She can then carry out a suicide attack by letting her child drink the chemical potion that brings on a Black Wind, which will kill all of the crewmembers of ships that come in contact with it. Black Wind's memorable characters, realistic historical background, unspeakable horror, and many unexpected twists and turns make this novel a highly worthwhile and enjoyable read.